But Reppert wanted to figure out how the monarch’s time-compensated sun compass works, so he couldn’t rely on the fruit fly model—fruit flies don’t use a sun compass, time-compensated or otherwise. He decided he needed to take a closer look at the monarch clockwork, to see how the butterfly clock works. Because the fruit fly and the monarch are close evolutionary relatives, they share many of the same genes. Reppert’s group had already found that each of the genes encoding the fruit fly clock’s main gears has a counterpart in the butterfly clock, with a similar gene sequence. So far, it looked like the fruit fly clock was a good approximation of the monarch’s. But that would soon change. In the wake of the discovery of [a] suggestive CRY pathway in the monarch brain, Reppert’s group had begun a series of experiments to uncover the molecular underpinnings of migration. While these studies weren’t aimed specifically at the circadian clock, they yielded an unexpected insight into the clock’s gears. Reppert wondered what, at the molecular level, distinguished non-migratory summer butterflies from migratory fall butterflies. Were there particular genes that were active in migrants on their single-minded southbound treks, but inactive in non-migrants on their desultory northbound hops? Or vice versa? Back in the lab, postdoctoral researcher Haisun Zhu was removing hundreds of monarch brains and grinding them to mush. He made one pool of mush for northbound summer butterflies, and another for southbound fall butterflies. With the help of another lab, the pools of brain glop were analyzed to catalog all the genes that were active in each. They found about 10,000 unique genes, more than 400 of which were active to substantially different degrees in the two monarch populations. These genes, Reppert knew, held the secrets to why and how monarchs migrate—why a monarch hatched in May will go about the normal business of being a butterfly, while a monarch hatched in September will be drawn irresistibly toward Mexico. Meanwhile, at the University of California, Irvine, Adriana Briscoe—one of Reppert’s longtime collaborators—was looking through a similar catalog of mosquito genes when she noticed something bizarre. As expected, the mosquito had a CRY gene similar to that in the fruit fly. But unexpectedly, it also had a second CRY gene—one that looked much more like that of a mouse. Just as in the fruit fly clock, the mouse clock keeps time using feedback loops. A number of clock proteins, which interact in an intricate network, are assembled and then destroyed in a cycle that takes about 24 hours to complete. Because the two clocks have been evolving independently for hundreds of millions of years, the mouse gears are different from the fruit fly gears. The mouse does have CRY genes of its own—two similar ones, in fact—which are only distantly related to the fly’s CRY. So what on Earth was a mouse-like CRY doing in a mosquito? Briscoe called Reppert to tell him the weird news. Reppert remembers being surprised; “Really?” he recalls asking her. She suggested he check the newly minted monarch catalog for a similar gene. “And we looked,” says Reppert, “and lo and behold, there was a second cryptochrome”—one that bore a striking resemblance to the mouse version. “This,” he adds emphatically, “had never been discovered.” It was one of those truly serendipitous scientific moments, when chance and circumstance come together to produce an extraordinary finding. Suddenly there were countless questions to be answered, countless experiments to be performed: What does it mean that the monarch and the mosquito have two distinct CRYs? What is the function of each? Does the mouse-like protein function the same way in the monarch that it does in the mouse? Are there more insects out there with both kinds of CRY? Reppert’s group got right to work. In the fruit fly, CRY is the messenger through which light resets the clock, to keep it in sync with the rising and setting sun. In the mouse, the CRYs play a very different role. The mouse proteins don’t absorb light; they instead function as essential gears in the clockwork mechanism, the feedback loop that keeps 24-hour time. For convenience, the fly-like version of the monarch gene was dubbed CRY1, and the mouse-like version CRY2. Reppert suspected that CRY1 would respond to light, as in the fruit fly, and CRY2 would be part of the feedback loop, as in the mouse. To verify this hunch, Zhu and Quan Yuan, another postdoctoral researcher in Reppert’s lab, began to investigate how these proteins behaved. In the first series of experiments they compared each protein to the light-absorbing fruit fly CRY. So for each protein they asked, can it sense and respond to light? When they shined light on the monarch CRY1—and that of the mosquito—the proteins responded strongly. In contrast, when they shined light on the monarch and mosquito CRY2 proteins, there was no response. In short, the monarch and mosquito CRY1s were behaving like fly CRY, and the corresponding CRY2s were not. Next, the group tested each CRY for mouse-like function. So this time they asked, which proteins can function as a gear in the clock? To do so, they created an artificial clock-like system. Into this system they threw each protein, to see if it could integrate itself. And this time, the monarch and mosquito CRY1s failed the test, while their CRY2s passed. With the CRY1s, the clock wouldn’t tick; with the CRY2s it kept time. Taken together, all these experiments suggested that Reppert’s hunch was correct. Function seemed to match form. The fly-like CRY1s seemed to behave as light receptors, just as in the fly. And the mouse-like CRY2s appeared to feed into the central clockwork, just as in the mouse. In April of 2006, Reppert’s group published these preliminary results in Current Biology, in a paper entitled “The two CRYs of the butterfly.” Since then, they have continued to experiment with the butterfly’s two CRYs, trying to confirm their disparate functions. Using an arsenal of new approaches, the group has been amassing more and more evidence to support what amounts to an astonishing discovery with wide-reaching implications. Inspired by the monarch and the mosquito, Reppert and Briscoe wondered whether other insects might have a second CRY as well. To find out, Briscoe searched through the gene sequences of several insect species, looking for genes that resembled either the fly-like CRY1 or the mouse-like CRY2. What she found was that even among the insects—which were all previously assumed to resemble the fruit fly—there are several ways to build a clock. First was the fruit fly, with just its lone, archetypal CRY1. Second was the monarch, joined by the mosquito, the Chinese oak silkmoth, and the commercial silkworm. All these insects had two CRYs—one that was fly-like, and one that was mouse-like. And finally, a third type of insect clock turned up, in the honeybee and the beetle. These bugs had the mouse-like CRY2 but not the fly-like CRY1. Parts of their circadian clockwork, it seemed, might be better typified by the mouse instead of the fruit fly. In light of these insights, Reppert argues that the fruit fly is an inadequate model for insect circadian clocks. True, the fly is backed by a formidable edifice of tools and protocols, but among insects its clock is more the exception than the rule. Perhaps, Reppert believes, the insect clock would be better exemplified by the colorful monarch butterfly. Incorporating elements in common both with other insects and with mammals, the butterfly clock could help us better understand how clocks work and how they have evolved. “It’s really a new sort of frontier for clock studies,” Reppert says of the evolutionary insights that CRY has made possible. He refers to the monarch’s circadian clock, with its two CRYs, as an example of the “ancestral clock”—the kind of internal timepiece from which other clocks have evolved. In these clocks, one CRY mediates the resetting effects of light, while the other CRY is an essential gear in the clockwork. The other two kinds of clocks, which have either CRY1 or CRY2 but not both, likely represent evolutionary adaptations. Those with only CRY1—like the fruit fly—have developed some other gear to replace CRY2 in the clockwork. Those with only CRY2—like the bee, the beetle, and even the mouse—have developed other ways to sense light. In the mouse, for example, light enters the clock by way of the eyes. By studying the circadian clock, Reppert and his colleagues are beginning to unravel some of the mysteries behind the monarch butterfly’s spectacular yearly migration. And by studying the monarch butterfly, they have stumbled upon some unexpected insights into the molecular workings and evolutionary history of the circadian clock. 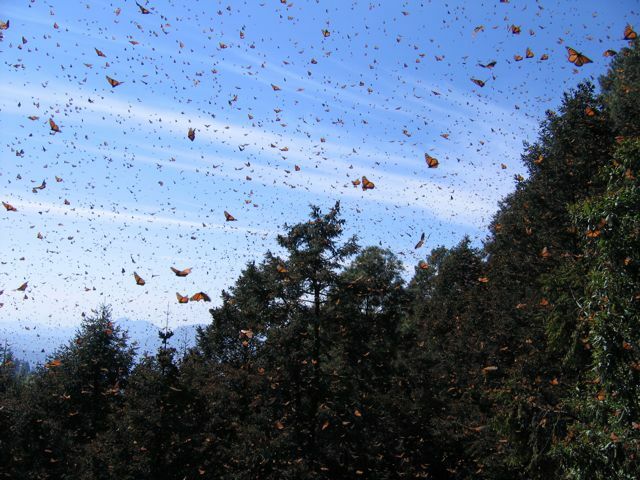 Below: monarchs in Michoacán, Mexico. Photo by me. Thanks Jocelyn for your thoughtful words. I must say that you really “get” what my laboratory is trying to do. There are difficult studies, as the two paper just published took over 3 years of very hard work from a team of over 10 dedicated scientists. I am very glad that you can put out work into proper perspective, which is critical for us to advance the field. I hope others will also appreciate what we are trying to do. This is an excerpt. Could you send me the whole thing?